As I mentioned with my Hurricane Irene Penne Pasta, impending severe weather makes me want to cook. The latest hype here in the Northeast is Hurricane Sandy, AKA Frankenstorm, which is currently being touted as the hurricane to end all hurricanes. My kids are terrified of missing Halloween. I am terrified of missing my Ina Garten book signing. However, I know the news media loves the panic inducing rating’s gold of a big storm, and there is a good chance this will be no big deal. When I start getting overly anxious, I try to keep that in perspective. Nevertheless, it’s hard not to get swept up in the hysteria. And when I get swept up in hysteria, I eat. And when I eat, I bake. This recipe has been sitting in my files for a while, and it’s perfect for some hysterical baking, Frankenstorm or not. Do heed the warnings about letting it sit overnight before releasing it from the spring-form pan; time is your friend when it comes to cheesecakes. This is very rich, so a little slice goes a long way. The ginger snaps in the crust are a lovely addition, as is the sour cream topping. Perfect for Thanksgiving. 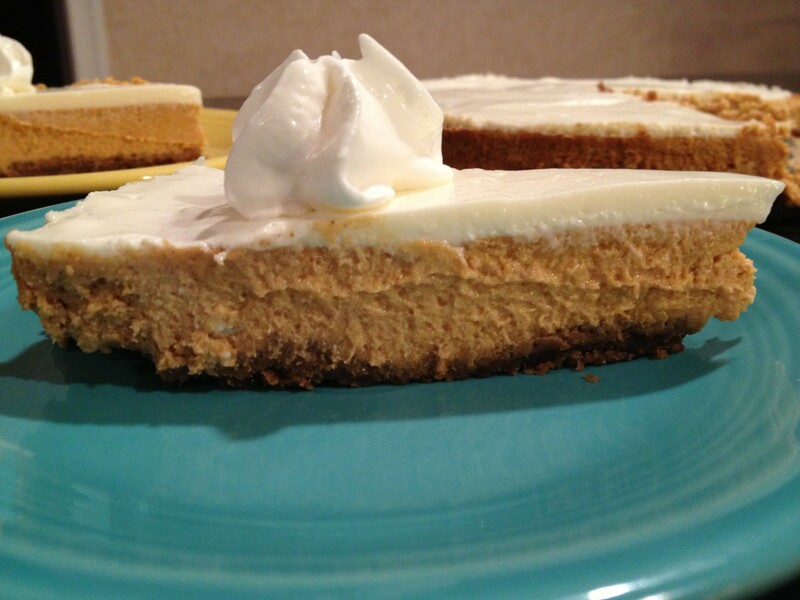 Pumpkin Cheesecake: Preheat oven to 350 degrees F (177 degrees C) and place the oven rack in the center of the oven. Butter, or spray with a non stick spray, an 8 inch (20 cm) spring form pan. Crust: In a medium sized bowl combine the graham cracker crumbs, crushed ginger cookies, sugar, and melted butter. Press the mixture evenly onto the bottom of the prepared pan. Bake 8-10 minutes or until set. Let cool. In a separate bowl, stir to combine the sugar, cinnamon, ginger, cloves, nutmeg, and salt. In the bowl of your electric mixer (or with a hand mixer), on low speed, beat the cream cheese until smooth (about 2 minutes). Gradually add the sugar mixture and beat until creamy and smooth (1 to 2 minutes). Add the eggs, one at a time, beating well (about 30 seconds) after each addition. Scrape down the sides of the bowl and beat in the vanilla extract and pumpkin puree. Pour the filling over the crust and place the spring form pan on a baking sheet to catch any drips. Place a cake pan, filled halfway with hot water, on the bottom shelf of your oven to moisten the air. Bake the cheesecake for 30 minutes and then reduce the oven temperature to 325 degrees C (160 degrees C) and continue to bake the cheesecake for another 10 – 20 minutes, or until the edges of the cheesecake are puffed but the center is still a little wet and jiggles when you gently shake the pan. Total baking time 40 – 60 minutes. Meanwhile stir together 1 cup (240 ml) sour cream, 1 teaspoon pure vanilla extract and 1/4 cup (50 grams) white sugar. Spread the topping over the warm cheesecake and return the cheesecake to the oven and bake about 8 minutes to set the topping. Remove from oven and place on a wire rack to cool. Loosen the cake from the pan by running a sharp knife around the inside edge (this will help prevent the cake from cracking). Then place a piece of aluminum foil over the top of the pan so the cheesecake will cool slowly. When completely cooled, cover and refrigerate at least eight hours, preferably overnight, before serving. This entry was posted in Desserts, Uncategorized and tagged Hurricane Sandy, pumpkin cheesecake, Thanksgiving desserts by Mom Mom's Apron. Bookmark the permalink. Dawn, it looks so good, and I might make it for Thanksgiving. Other than that, tooooo sinful! I also feel like cooking when the weather gets bad. It makes you feel more into the home and its many delights. Just finished making Beef Bourguignon! I will be 20 pounds heavier by the time Sandy blows through. Cheerios, wow, the big time! That’s a wonderful-looking cheesecake! Hope the storm isn’t too bad for you. Thank you! Crossing my fingers, too. Mine is cooling on the counter 🙂 Thanks, Dawn! Hi Chris! Hope you love it. It was great. Best pumpkin cheesecake I have made. That makes me so happy! My family loved it, too. Unfortunately, it contributed heavily to my Hurricane Sandy weight gain.